"my mind is blanK. I'LL escApe this pLace that shackLes me. freedom is at Hand. i may be at the UMbra of my sANity but i Shall escape with my PSYCHO POWERS"
Psycho Powers is an entry in the GMC Jam #2 where the theme was Insanity. It placed 3rd out of 28 entries. 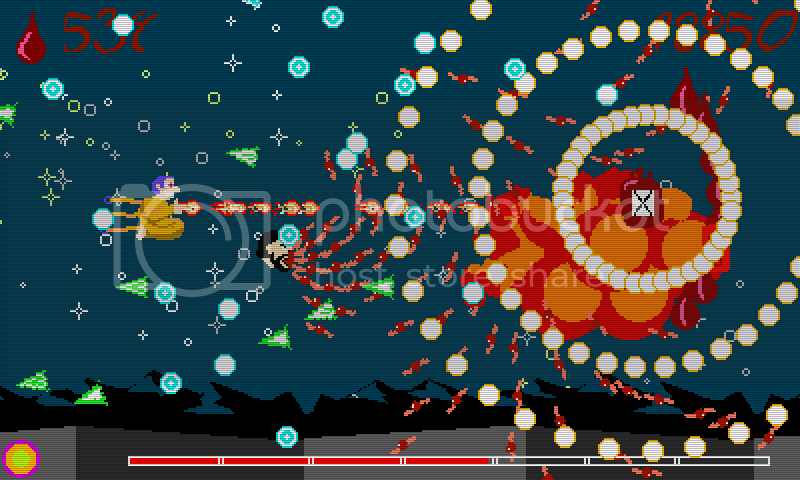 The game is a horizontal bullet hell shooter where you shoot crazy things and try not to die. Jam version: Psycho Powers v1.001 (Dropbox, 6.74MB) <-Warning, way too hard! Music by Alex 'Overdark' A. -Points are awarded for killing enemies. -Powerups award points if not needed. -Blood gives more points the more blood you have. -Excess blood (>1000) awards more points. -Blood stock is halved upon death. -Blood is drained continuously depending on how much you have. -I don't fully understand it myself anymore. -Fixed game over screen throwing an error. -Suicide counters added to major enemies to reduce milking. They're possibly too long. -Surface effect will disable silently rather than throwing errors if interefered with. -Added fullscreen with Alt+Enter and closing with Alt+F4 as Gates intended. -Changed stage boss too. Not telling you how. -Scoring system reworked. There was a missing paranthesis causing you to gain far less points than you should. -You continuously lose blood now. -HiScore now saves in an easily editable plaintext-file. Yay? Edited by zeddidragon, 08 April 2012 - 04:29 PM. This post is gonna be filled with cool screenshots later! Watch this space! Edited by mrawoodcock, 03 May 2011 - 01:09 AM. Thanks for finding that! Just in time for the Jam end too! Edit: It's been fixed, obviously. Edited by zeddidragon, 03 May 2011 - 01:30 AM. It appears my previous post didn't show up. Let's try again. Ahem. "The scanline effect makes every pixel on the screen look more important than all its neighbors, and together with the insane amount of bullets this makes Psycho Powers a truly dazzling experience." I'm overdark, and this is my favorite game on the Citadel! To those who are worried, no, this is not spam; I'm the guy who did the music for Psycho Powers. Edited by overdark, 07 May 2011 - 07:04 PM. Psycho Powers has been updated! If you gave up because it was too hard you should try it again. It's a lot easier now. Instant play? Or is it 8.1? Downloaded and tried the new version. MUCH better. Haven't finished it yet, but at least there's hope now. Managed to get to the last boss with all three lives. And then I lost them all on the second bullet pattern. Christ this game is hard. Nice updates though. Seems all the major problems have been fixed. awesome game! The hard version is.....hard..... but i like it, its def beatable. are you gunna continue to develop this game? If so, try to differentiate a little more between bullets and other objects. I'm currently playing the hard version. It lives up to its name. I haven't even gotten down the easy mini-boss' HP below 50%, but I'm still having a lot of fun and improve after each play (or at least, so the highscore says). For the sake of your sanity, I would recommend the newer version. It saves your high-score, as well as not having the final boss be completely unfair. Wow, finally got around to trying this, and it's insane! Literally! I could feel myself losing touch with reality while playing. Scary. There are a lot of things working really well together in this game, the music goes well with the game, and I like the graphics, it has that kinda rough feel to it, but works really well (for me, anyway). I game over'd at this big brain-looking thing. They aren't as active as they use to be (well, they are near dead) but still: It's a place to post it, and it has a lot of history! That would be the game's half-way point. Good luck! I took a look at that shmup-forum but I wouldn't feel right submitting Psycho Powers there until I add the extra stuff I always mean to but never get around to adding. I used those 2 head things the whole time (basically). No idea if that counts as cheating, but heck, I needed the fire power. I didn't die once until I beat that brain thing. Then I died. Honestly, I don't even know why, I'm sure nothing hit me. I died 2 more times, for similar reasons. Around the 3rd time I was getting nervous about it, and ready to blame the game, but luckly I finished before then! Craaaazy. At least I'm 2-0 against Zeddy's games. Btw, nice graphics, if I didn't say that already. Edit: Btw, get a proper game icon. Edited by Desert Dog, 30 January 2012 - 11:14 PM. Very nice game you got here, had fun for a while with it.